Ogmore can offer a great variety of fishing spots all with good parking. It can get very busy in the summer months with tourists or when fishing well. One issue with Ogmore is the amount of rubbish on the ledges, please put anything you bring to the spot with you in the bin or take it home. This does not give anglers good name in a spot visited by so many tourists. Ogmore estuary is on the right hands side of the main road on the way in to Ogmore-by-sea. Plenty of safe areas to park and offering the cahnce to try out different types of fishing wether it be float,lure or ledger. Best fished at low tide with a mud/silt bottom the estuary can offer the chance to catch flounder, mullet, plaice and the odd bass. Just at the left hand end of the carpark is another good mark, "cods gully" as its known consists of a small shingle beach with rock ledges either side. This has proved to be an excellent mark throwing up a some good fish over the early summer months. 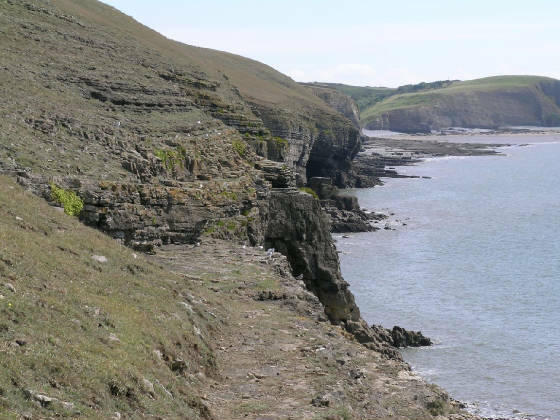 Ogmore Deeps comprises of a series of large rock ledges which offer easy access to deep water. The bottom consists of sand, rocks and sea weed beds and can offer some great fishing not just on the beach casters, but on the float too. This area can get extremely busy with anglers when fishing well. Casting is not an issue as even at the rock ledges base the water is a good depth. There is a small parking area if you follow the main road through Ogmore past the main carpark (next to estuary) and up over the hill, just past the cattle grid on your left. One point to make is Ogmore is NOT fishable in strong winds. Many anglers have been washed off the ledges so never attempt in strong winds or big tides. Expect to catch mackerel, garfish, dogfish, bass, conger and some rays in the summer. Codling, whiting and pouting in winter. Bets baits include Lug, rag, mackerel and Peeler crab.